Movistar‘s Juan Jose Lobato claimed stage 3 of the Dubai Tour today, after powering his way up the Hatta Dam to take the victory ahead of Giacomo Nizzolo (Trek-Segafredo) and Silvan Dillier (BMC). “This victory makes me immensely excited and happy – I owe everything to my team-mates for their support. We knew we had to stay calm until the downhill after the last climb and give everything afterwards. They all were phenomenal in the finale, just like throughout the race. I knew the climb from last year’s finish and it was one that really liked and suited me. I learnt there that being in a good position into that last corner right was crucial; last year I couldn’t get things done right, but this time was the good one. “I’ve worked really hard during the winter and this is a reward for that sacrifice, a proof that my condition is perfect at the moment and an extra boost of morale for the spring. I want to do well in the classics – it’s been long spoken about Sanremo and me; the team likes the race, I personally love it and I want to keep that form coming. I put too much pressure on myself last season and couldn’t be up there – let’s hope we make it in 2016. I also think about those other classics: Gent-Wevelgem, De Ronde… I won’t focus entirely on them, to avoid that pressure, but I’d still like to give them a try. “For the time being, I’m already very happy to get my first win of the season here. Tomorrow? Let’s hope I still stand a chance to win overall; I’m happy with today’s success, but last year I took more risks into that flat finish and even got a 3rd place. You never know; it’s still at my reach. Unlike the opening first two stages which were entirely flat, today’s stage featured a series of challenging climbs – including with the 19%, 500 meter accent of the Hatta Dam. Lobito received an excellent leadout from his teammates Alex Dowsett and Jonathan Castroviejo during the final climb, allowing the Spanish rider a final burst of acceleration in a run up to the summit, to claim the stage honors ahead of Nizzolo and Dillier. A small breakaway group containing Francisco Mancebo (Skydive Dubai), Chun Kai Feng (Lampre-Merida), Andy Tennant (WIGGINS), Hayden McCormick (One Pro Cycling) and David Lozano Riba (Novo Nordisk), enjoyed the being in the limelight for most of today’s stage, eventually building up a maximum advantage of 2:15 over the peloton. Meanwhile, Team Sky was content in keeping the tempo high back in the chase, as they sought to protect the interests of their race leader, Elia Viviani. However, as the race reached the final climb of the Hatta Dam during the last 15 kilometers, little by little the escapees were all reclaimed by the peloton. From there, Dimitry Gruzdev (Astana) initiated an attack, bringing Laurens de Vreese and Ben Swift along with him. But, a further 5 kilometers later, saw the trio reeled back in by the chase. With 3 kilometers remaining, Movistar took to the front, along with Trek-Segafredo, who was trying to position both Nizzolo and Fabian Cancellara to contest the summit finish. But, with 600 meters to go, the BMC duo of Philippe Gilbert and Samuel Sanchez attempted a final attack, but to no avail. With Cancellara cracking alongside of him, Lobato decided to make his move, with only Nizzolo able to respond to his acceleration. 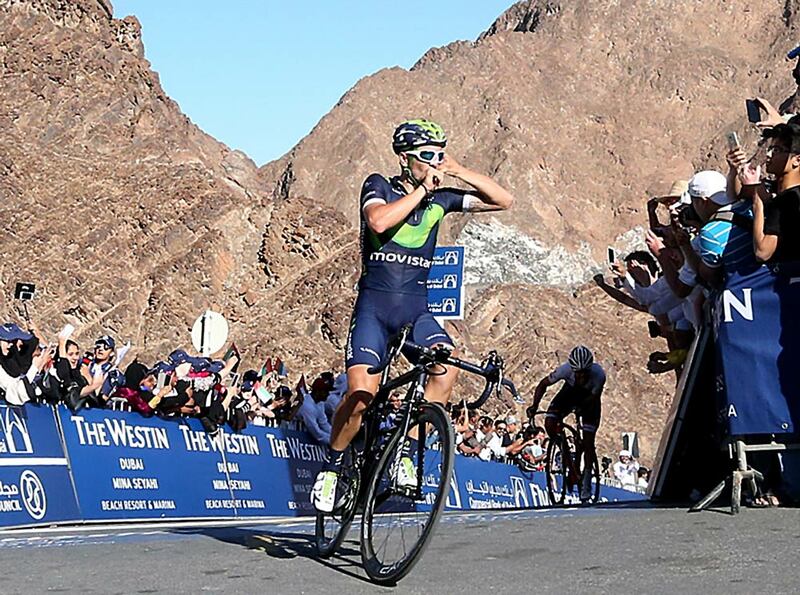 But, it was too late for the Italian rider to catch the Spaniard, who went on to clinch the victory by 2 seconds. Meanwhile, BMC’s Silvan Dillier was arguably the fastest rider up the Hatta Dam climb, but he came from too far behind to mount a serious challenge to Lobato. Still, his efforts were enough to pipe along the way Cancellara to steal third place. 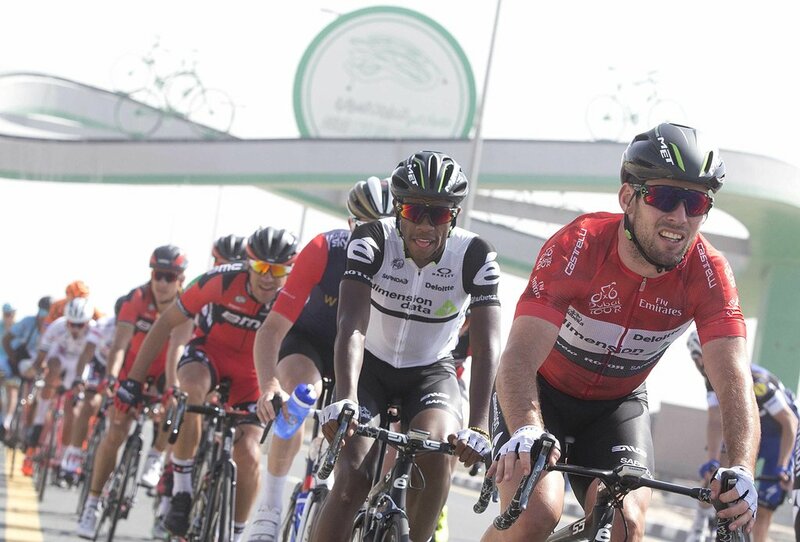 Back in the peloton, Mark Cavendish’s chances of winning a second consecutive Dubai Tour came to a close, after he crashed around five kilometers from the finish line – eventually finishing some six minutes down on Lobato.